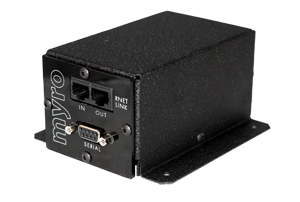 Myro:Bridge allows you to easily connect and control components like Sonos players and HDMI Matrix Switchers from your Russound Whole House Audio System using RNET. 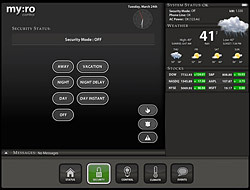 You can also use Myro:Bridge and Sonos with any home control system that has RS-232 capabilities (e.g. 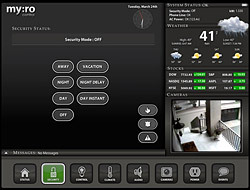 Crestron, Control4, AMX, RTI) as well. Yes, you can now integrate a Sonos:Connect with any system that can support RS-232 control and provide 2-way metadata and transport control! Drivers, manuals and firmware files are available at www.myrobridge.com. Designed, engineered, assembled and made in the U.S.A. using domestic and foreign parts. Myro:Air is a high-quality AirPlay receiver that is easily integrated with home automation and control systems. Featuring Wolfson's flagship WM8741 DAC the audio quality is as good it gets. - Control protocols, Crestron Example, drivers and firmware files are available on our forum. Visit the Myro:Air website for more details. 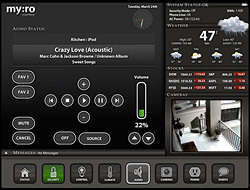 If you don't currently need IP Camera, Whole House Audio and Energy Monitoring Support, then Myro:Home "The Basics" gives you Security, Lighting, Climate, Status, Events, Messages, Weather, and Stocks "The Basics". You can alway upgrade to "The Works" at a later time. You are purchasing a single (1) user license key. License key file and unlock instructions will be emailed to you once payment has been made. By purchasing this license key you have read and accept the End User License Agreement (EULA). Once licenses are issued and emailed, no refunds can be granted so please use the trial first. This license allows you to use every feature as was in the Trial. If you need IP Camera, Whole House Audio and Energy Monitoring Support, then Myro:Home "The Works" is for you. This license will upgrade "The Basics" version of Myro:Home to the "The Works". A new license will be emailed once confirmation that a previous license has been purchased. Copyright © 2019, Myro Control, LLC. All rights reserved.